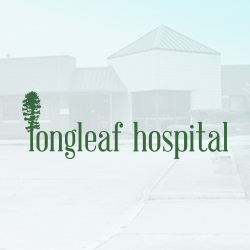 Longleaf Hospital is a 92 bed behavioral health acute care inpatient hospital for children, adolescents, adults, and geriatrics who are experiencing emotional or behavioral problems. Treatment is offered through a range of multi-disciplinary programs in a therapeutic, confidential and safe environment. Longleaf Hospital's purpose is to provide high quality services that respond to individual, family, and community needs in a healing place. We are committed to the highest quality medical and business practices.